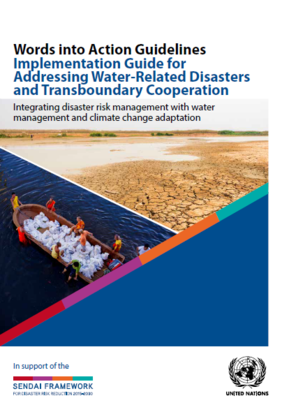 The Sendai Framework for Disaster Risk Reduction 2015–2030 was adopted at the Third United Nations World Conference on Disaster Risk Reduction (WCDRR) in Sendai, Japan, in March 2015 and was subsequently endorsed by the United Nations General Assembly. In order to support the process, a number of targeted Sendai Framework implementation guides are being developed to generate practical and evidence-based guidance for its implementation in close collaboration with States and through the mobilization of experts, thus reinforcing a culture of prevention among relevant stakeholders. the values of river basin management and transboundary cooperation, together with good practices from all over the world and lessions learned in this field.